Lexington, Ohio – Englishman Jack Harvey has shown good speed throughout this season since switching his sights on North America and Indy Lights Presented by Cooper Tires after some impressive performances in recent years both in Formula 3 and GP3 in Europe. Today, at the scenic and challenging Mid-Ohio Sports Car Course, Harvey, 21, put behind him a sequence of nine successive top-five finishes by qualifying Schmidt Peterson Motorsports with Curb-Agajanian’s #42 Racing Steps Foundation car on the pole and then dominating the 30-lap race. Harvey was never seriously challenged en route to a clear victory by 17.340 seconds over series leader Gabby Chaves (Belardi Auto Racing). The banner day for Harvey began this morning when he posted the fastest lap in qualifying, 1m13.9519, to secure his first Indy Lights pole by 0.2647 seconds over Brazilian teammate Luiz Razia. Heavy rain a little later in the morning had passed through the area and the track was almost completely dry by the time the drivers took to the grid for the Grand Prix of Mid-Ohio, with every car starting on dry-weather Cooper tires. 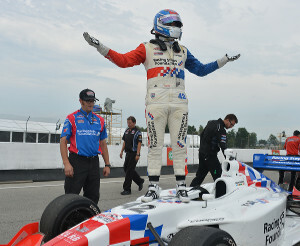 Harvey immediately jumped into the lead while Razia came under pressure from third fastest qualifier Zach Veach (Andretti Autosport) at the first turn. Veach had to tuck into third, followed by teammate Matthew Brabham and Chaves, who had lost a position after starting in fourth. The opening few laps were thoroughly entertaining, especially for Chaves who picked off Brabham, Veach and Razia on consecutive laps under braking for Turn Four to move from fifth to second. By then Harvey was already a couple of seconds farther up the road. The gap from first to second diminished slightly over the next few laps before Harvey really found his groove and pulled away with seemingly effortless ease. Chaves was content to finish a lonely second, secure that the result allowed him to extend his championship lead to 29 points. Brabham and Veach exchanged fourth place a couple of times in the early stages before Brabham made the place his own. Suddenly, on Lap 25, while piling the pressure on Razia for third, Brabham experienced gear-shift difficulties and fell away rapidly. Curiously, after one slow lap, the problem rectified itself, but by then Veach was long gone in fourth place and Brabham had to settle for fifth. Zimbabwe’s Axcil Jefferies impressed en route to a sixth-place finish in his first Indy Lights race of the season for Belardi Auto Racing. Jefferies lost a couple of positions early but soon picked up the pace, passing Scott Anderson (Fan Force United) on Lap 20 and then usurping Team Moore Racing’s Zack Meyer when the Canadian made a small mistake just four laps from the finish. Chaves earned the RePlay XD Move of the Race Award for his pass of Veach in Turn Four on Lap Three to take over third place. Additional contingency awards included a customized Race Energy BCM21 charger – the official battery of the ladder series – to the winning team of Schmidt Peterson Motorsports with Curb-Agajanian. Round 11 of Indy Lights Presented by Cooper Tires will start at 11:55 a.m. EDT tomorrow morning.